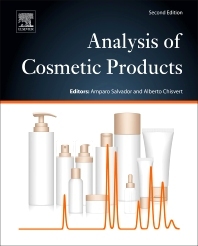 Analysis of Cosmetic Products, Second Edition advises the reader from an analytical chemistry perspective on the choice of suitable analytical methods for production monitoring and quality control of cosmetic products. This book helps professionals working in the cosmetic industry or in research laboratories select appropriate analytical procedures for production, maintain in-market quality control of cosmetic products and plan for the appropriate types of biomedical and environmental testing. This updated and expanded second edition covers fundamental concepts relating to cosmetic products, current global legislation, the latest analytical methods for monitoring and quality control, characterization of nanomaterials and other new active ingredients, and an introduction to green cosmetic chemistry. Amparo Salvador is a Professor in the Department of Analytical Chemistry and heads the Research Group for the Analytical Control of Cosmetic Products at the University of Valencia, Valencia, Spain. She has authored more than 170 scientific publications and is an expert in a number of analytical technologies, including atomic and molecular spectroscopy, flow injection techniques, chromatography, sample preparation methods, and green analytical procedures. Alberto Chisvert is an Associate Professor in the Department of Analytical Chemistry at the University of Valencia, Valencia, Spain. Prof. Chisvert is the lead research supervisor within the Research Group for the Analytical Control of Cosmetic Products. His primary areas of interest are liquid and gas chromatography coupled to mass spectrometry, liquid-phase and solid phase microextraction techniques, bioanalysis, and cosmetic, pharmaceutical, and environmental analysis. With co-author Amparo Salvador, he has written more than 70 publications specifically related to the analysis of cosmetic products and has conducted four major research projects for the Spanish Ministry of Science. He is a member of a committee for the standardization of analytical methods for cosmetic products which provides advisory recommendations to the Spanish Association for Standardization and Certification, the National Association of Perfumes and Cosmetics (Spain), the European Committee of Standardization, and the International Organization for Standardization.